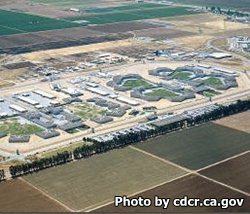 Salinas Valley State Prison is located in Soledad California. The facility is responsible for the incarceration and rehabilitation of minimum to maximum security inmates. Currently this correctional facility houses over 4,500 Level I-Level IV inmates, which is double the original constructed capacity. Salinas Valley State Prison has a wide variety of educational and vocational programs as well as a dairy farm that select inmates can work on. Some of the educational opportunities that exist for inmates are adult basic education, GED, English second language, and a re-entry program that helps prepare inmates for release. Some of the vocational studies include landscaping, auto body repair,and custodial work. Inmates are encourages to participate in the various self help groups including Alcoholics Anonymous, Narcotics Anonymous, and cage your rage/alternatives to violence which focus on self control and mediation through talking. If you have submitted a visitors application and it has been approved then you are eligible to visit an inmate. Visiting is on Saturdays and Sundays from 8:30am-3pm, you must arrive prior to 1:30 to be admitted to visitation. Anyone wishing to visit an inmate on administrative segregation inmates or an offender who can only have non-contact visits must schedule a visiting appointment online.